The birthplace of magic realism exceeds its reputation. The I Love The Burg and That’s So Tampa crew flew to the technicolor shores of Cartagena, Colombia this spring courtesy of Copa Airlines. Over the course of 96 hours, we engaged with a culture steadfast in its traditions, pronounced in its jubilance, with an illimitable regard for its torrid history and bright future. The late trip aboard Copa’s Boeing 737 was made resplendent with free drinks — a mile high toast is customary — and meal. Copa’s quick route to Cartagena — under three hours to Panama, and a 50 minute puddle jump to Colombia — underscores how the airline has elevated TPA’s travel game. They’re making travel fun again. The airline offers some of the best fares and shortest routes to premier South and Central American destinations. Quench your thirst for adventure by browsing Copa’s routes and fares today. Our plane arrived at midnight, a fine hour to brush up on our Spanish. We had no issue finding a cab; drivers were waiting curbside, eager to take exhausted passengers to their destination. ProTip: Be prepared to barter. There are no set fares/rates for cabs. A 5-10 minute ride from the airport could cost anywhere between 8,000-10,000 pesos — about 4 American dollars. Tipping is neither customary nor expected, but it is always appreciated. Phrase to remember: Cuánto cuesta, which translates to how much, followed by your destination. The quiet evening at Hotel Corales De Indias was only ever startled by the curved waves of the Caribbean Sea weaving white caps over one another into a fine blue basket. Our first day there was meant for untethered adventure. We began with a walk through the districts of the historic walled city: El Centro and San Diego. Powder blues and fluorescent yellows tattoo row upon row of colonial architecture. In an alley bookended by Cafe Havana, a man tests the integrity of his roadsters kickstand as he tosses raw geometric cuts of chicken onto a grill. An incendiary marinate perfumes the air. Across the cobblestone street, another vendor wraps hearty arepas in grease paper for passersby. In the San Diego District, all references lead us to Carmen — a restaurant started by the husband and wife team of Rob Pevitts and Carmen Angel. Behind a quaint exterior looms an emerald city of local flavor infused in modern recipes. The La Playa (The Beach) is a fine preamble to the meal that lies ahead. This starter features octopus, shrimp and white fish ceviche, citrus tiger’s milk, edible sand and coconut rice sea foam. For the main course: Lomo Fino. Savor plancha seared beef tenderloin, pommes purée Robuchon, braised swiss chard and roasted bone marrow jus. After devouring a bit of contemporary Colombian cuisine, it’s time to embrace its history. The focal point of the expansive Plaza is Iglesia de San Pedro Calver. Construction of the church began in the late 1500s. At its altar are the remains of Saint Peter Calver who devoted nearly his entire life to liberating and evangelizing slaves. Only the sounds of exhausted floor fans and stray cat claws grazing the surface of a stone can be heard inside the structure. At its center is a tree which ascends to a blinding point and a litany of relics that remain a constant source of faith in the city. For a panoramic view of the majesty that exists within La Muralla de Cartagena, travel to the roof of Charleston Santa Teresa. From here, you can stand eye to eye the tops of the Jesuitic structures, while the shimmering high rises form through the rippling haze of Colombia’s heat. Pickup soccer games pop-up everywhere you look: on well tred patches of dirt outside the walled city, and on the burnt umber mounds of sand, with two sets of stakes serving as a goal. As we learned on our ascent up Castillo San Felipe de Barajas, the sport of the city is actually baseball. From the peak of the Castillo we witnessed two community games with dueling playlists commence; dingers reign over the respective chain link fences and take shelter beneath picnic tables where an accidental audience throws the ball right back to the field. Situated on the hill of San Lazaro, construction on Castillo San Felipe de Barajas began in 1536, and expanded in 1657 and 1763. An intricate system of tunnels and towers make the fortress a feat of military ingenuity. A labyrinth of meticulously laid out bunkers make it nearly impervious to invasion. Today, the castle serves as a historic heritage site. The Colombian flag waves proudly atop the fortress. 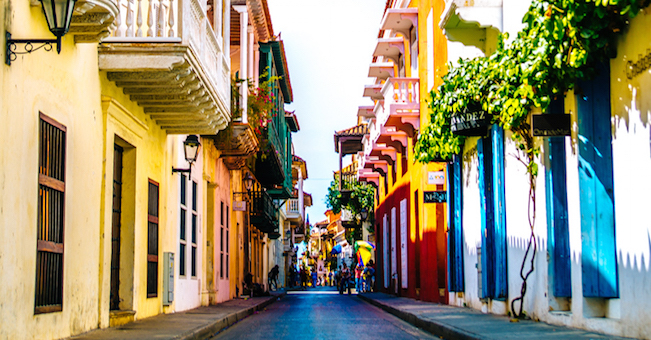 Visitors who make the trek all the way up can gaze down at local neighborhoods, Cartagena’s rising downtown area and local music and culinary gems that frame the area. We tasted the culture, climbed through Cartagena’s history and so it was time to take a deep dive into the luxurious, white sand beaches just a quick boat ride away from the city. Juan Ballena Travel assisted in helping us discover the perfect escape: Rosario Islands — Gente Del Mar. Once on the beach, options for activity abounded. Beach volleyball courts were arranged in front cushioned lounge seats. Kayaks were available, and a snorkeling adventure departed shortly after we anchored at the island’s dock. An intermission of pargo rojo (fried red snapper), sweet coconut rice, tostones and fresh Colombian roast coffee served to revitalize the group after an afternoon in the sun. A dip in the crystalline waters was made divine by a hard limonada de coco (coconut limeade). If you were only able to do one thing with your time in Colombia, we recommend you visit the Avario Nacional de Colombia. The National Aviary protects and celebrates the diverse species that call the country home; on site staff serves as both guides and educators as you meet exotic, technicolor birds. Toucans with rainbow kissed beaks, cotton candy pink flamingos, the formidable Andean condor, proud peacocks and parrots, an array of great owls and even a few iguanas populate the nearly 6-acre sanctuary. Open trails allow for comfortable strolls between each section of the sanctuary. Over 2,000 birds from 140 species are represented at the aviary; 15 of the species are in danger of extinction. The aviary keeps these species in captivity so that they can be protected and cared for. The trip out to the aviary isn’t the smoothest, but its well worth every bump off the beaten path. When in Cartagena, drink tons of coffee. The I Love The Burg crew is no stranger to mass coffee consumption. While we’re accustomed to seeing Colombia etched on bags in coffee shops all over Tampa Bay, we can say with certainty that nothing quite compares to the tasting experience we had at Café San Alberto. Colombia produces nearly 12 million bags of well-balanced coffee per year. Their roast is proof that quantity and quality can exist in harmony. A master barista gave us a scientific rundown of how to properly grow, nurture, cultivate, grind and even sip coffee. She then put our admittedly inexperienced taste-buds to the test. Flavor samples ranged from bitter and acidic, to sweet and salty notes. By the end of our mini coffee academy, we felt both omniscient and clueless. The only certainty we harbor is that Café San Alberto makes a cold brew that will wire you for days. After several days of adventure, you’d think our thirst for more may have been quenched. The allure of Cartagena can hardly be encapsulated in a brochure, a photo, a video or magazine. This city is dynamic, bursting with color, music and history, yearning for curious travelers to mine deeper. With the assistance of Pro Colombia and Juan Ballena Travel, we took an excursion beyond the foreboding walls of the Old City. We played soccer on the cinnamon-sugar sand beaches, ate our weight in garlic plantains, acquired a new appreciation for Colombian coffee, and were given ample reason to plan a return trip soon. En route back to Tampa, we once again took full advantage of Copa’s free in-flight breakfast — bacon and eggs, thank you — and complimentary drinks. Coffee was essential, and a petite flute of bubbly served as a proper sendoff to a trip we’ll soon make again. Most abroad trips come with their fair share of hangups and headaches, namely, customs. Fortunately, Tampa International Airport, an industry leader in customer service, offers expedient and friendly service. You can be through the process and on 275 in just 20 minutes. Special thank you to Copa Airlines for providing us with tickets to this magical place. Want to book your next trip? Follow this link to learn more about travel options with Copa Airlines.